Mohammed al-Shaibah, Air Cargo Director for Yemenia Airways said to Yemen Post, "No UPS cargo plane left Yemeni lands over the land 48 hours. These accusations are false and baseless. "http://www.yemenpost.net/Detail123456789.aspx?ID=3&SubID=2705&MainCat=3 If we get the tail numbers from these planes, can we get the flight info for these aircraft? I am going back through old reports now and am having no luck finding any mention of tail numbers. Anyone with knowledge on aircraft, please jump in here and tell me if we can verify the flight paths of these planes supposedly from Yemen. can`t make much of anything out on it ! Wouldn't the airport that these planes were to originally have listed the flight number and other details? The MD-11, the world's only modern large, wide-cabin trijet, offers a highly sophisticated flight deck and advanced automatic system controls that substantially reduce pilot workload. In service with customers in all parts of the world, the MD-11 was produced in Long Beach, California, at the Douglas Products Division of the Boeing Commercial Airplanes until February 2001. A worldwide network of subcontractors and suppliers supported the assembly line. The MD-11 was available in four models -- passenger, all freighter, convertible freighter and "combi," where passengers and freight are carried on the main deck with additional freight carried below the deck. An extended-range (ER) feature was available on all versions. Seating capacities on the standard airplane vary from 285 in a three-class arrangement to 410 in an all-economy configuration. Below the main deck, the MD-11 provides more space for containerized or palletized cargo after passenger bags are loaded than any other jetliner, yielding important additional revenue for its operators. Advances in aerodynamics, propulsion, aircraft systems, cockpit avionics and interior design contribute to the performance and operating economy of all MD-11 models. Aerodynamic improvements include winglets and a redesigned wing trailing edge, a smaller horizontal tail with integral fuel tanks and an extended tail cone. These features reduce drag, save fuel and add range. The nonstop range of the standard MD-11 operating at a maximum takeoff weight of 602,500 pounds (273,290 kg) is approximately 7,630 statute miles (12,270 km) with 285 passengers and their bags. The extended-range version of the MD-11, equipped with an auxiliary fuel tank and operating at a higher maximum takeoff weight of 630,500 pounds (285,990 kg), has a range of approximately 8,225 statute miles (13,230 km). Three engines -- General Electric CF6-80C2, Pratt & Whitney 4460, and Pratt & Whitney 4462 -- are offered to power the MD-11, providing maximum efficiency in their thrust class. The advanced flight deck features six cathode ray tube displays, digital instrumentation, wind-shear detection and guidance devices, a dual flight management system that helps conserve fuel and a dual digital automatic flight control system (autopilot) with fail operational capability. Computerized system controllers perform automated normal, abnormal and emergency checklist duties for major systems, reducing flight crew requirements from three to two persons. Industry-standard interlinked wheel-and-column controls enhance crew communications and situation awareness at all times. The MD-11 was launched on Dec. 30, 1986. Assembly of the first unit began March 9, 1988. First flight was on Jan. 10, 1990. Certification occurred Nov. 8, 1990, with first delivery on Dec. 7. For comparison, the MD-11 is 200 feet 10 inches (61.2 m) long, or 18.6 feet (5.66 m) longer than the earlier DC-10 trijet, and carries about 50 more passengers. "If you have embraced a creed which appears to be free from the ordinary dirtiness of politics - a creed from which you yourself cannot expect to draw any material advantage - surely that proves that you are in the right?" Do cargo planes not have tail numbers? TPTB got smart and figured that we`d check this and so used planes that are not traceable??? What about a flight number? An aircraft registration is a unique alphanumeric string that identifies a civil aircraft, in similar fashion to a licence plate on an automobile. In accordance with the Convention on International Civil Aviation all aircraft must be registered with a national aviation authority and they must carry proof of this registration in the form of a legal document called a Certificate of Registration at all times when in operation. Most countries also require the aircraft registration to be imprinted on a permanent fireproof plate mounted on the fuselage for the purposes of post-fire/post-crash aircraft accident investigation. Because airplanes typically display their registration numbers on the aft fuselage just forward of the tail, in earlier times more often on the tail itself, the registration is often referred to as the "tail number". Maybe though they do not list cargo flights? UPS, according to their annual sustainability report released Tuesday, plans to replace many of their old airplanes with a new, more eco-responsible fleet that will reduce their carbon emissions by 20%! This significantly adds to their overall carbon emissions reduction which is cumulative reduction of 42% since 1990. Hey carlee, where did you find that photo? Was it in a related story? We could of course FOI UPS / FED EX for the tail numbers . . .
A fourth plane has also been detained in England. 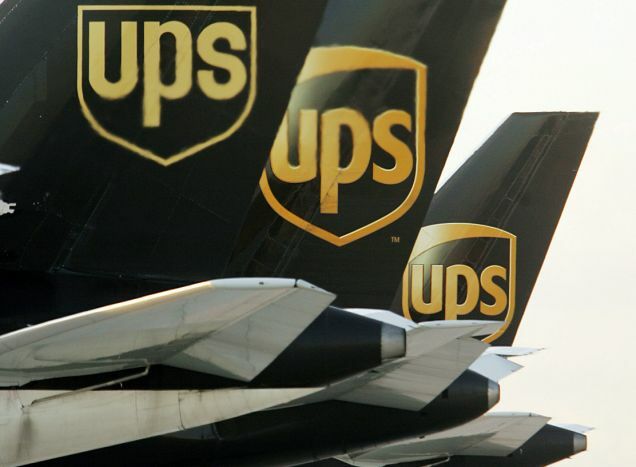 Local and federal authorities are investigating suspicious packages aboard a UPS plane that landed at Philadelphia International Airport at about 9 a.m. from Paris, France, and a plane, from Cologne, Germany, that has been isolated near the UPS terminal. The plane from Germany landed in Philadelphia at about 8 a.m. and was scheduled to depart at 10:30 a.m. for Louisville, Kentucky. Authorities say the incident in Philadelphia began when a crew member aboard the plane from Paris notified authorities on approach about a suspicious package. The two crew members safely exited the aircraft after landing in a remote area of the airport. My eyes are not this good but there is a tail number - anyone? "A fourth plane has also been detained in England. Local and federal authorities are investigating suspicious packages aboard a UPS plane that landed at Philadelphia International Airport at about 9 a.m. from Paris, France,"
Now, Can we get a N number with the flight number? 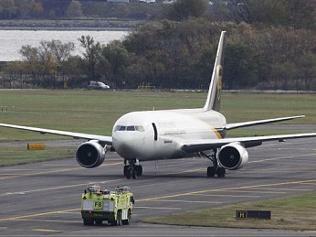 here is a pic of the # on the tail of the ups plane that was stopped at newark liberty airport,i believe. ...this was taken during a local broadcast,the special breakin news report that day. UPS 204 Tracking is not enabled for this flight. Flight Tracking is available for active flights originating or arriving within the United States, Canada and Europe. Flight tracking also depends upon the cooperation of the airlines and the completeness and accuracy of the data they submit. As a result, we are not currently able to track flights from some airlines such as Lufthansa and British Midland. Remember this recent incident in Dubai? History of UPS flights here, but have to register. The US Transportation Security Administration ordered several flights of UPS to be searched for suspicious cargo after a suspicious toner cartridge had been found on a UPS flight in East Midlands,EN (UK) today around 03:30L (02:30Z). The suspicous cartridge, reported as bomb by a TV station, proved negative on tests for explosives. The TSA at this point does not yet rule out a radiological background however. The TSA said, the suspicious toner cartridge appeared to be manipulated. At the time of the alert in East Midlands UPS flight 5X-232 from Cologne (Germany) to Philadelphia,PA (USA) via East Midlands, a B763 registration N330UP, was on the ground at East Midlands having arrived at 02:30L (01:30Z). The flight departed again at 04:30L (03:30Z) on schedule after the originally suspicious package was found harmless. The FBI reported, that none of the packages found in the US contained any explosives. The packages originated in Yemen and were sent by the same sender. The President of the United States of America Barack Obama said in a televised speech, that a credible terrorist threat existed. 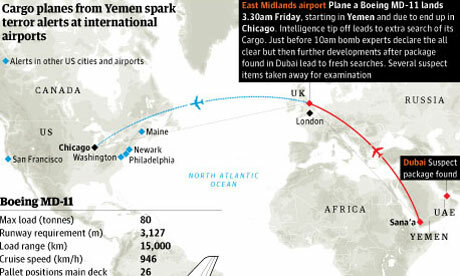 Packages located in England and Dubai (United Arab Emirates) appeared to contain explosives.